Over 30,000 Los Angeles teachers went on strike in the second week of January, demanding class size reductions, rather than a pay raise. 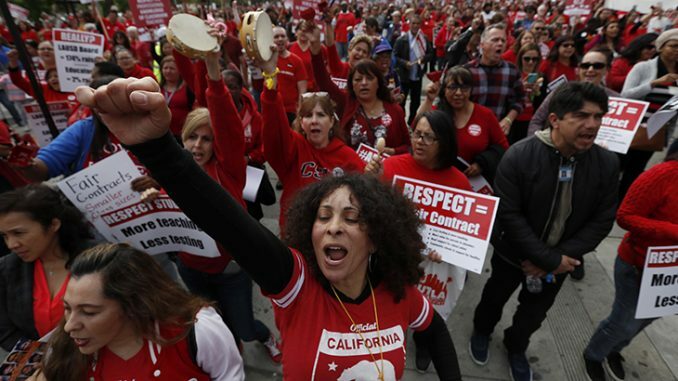 The strike was the city’s first in 30 years, after weeks of intense negotiations between the United Teachers Los Angeles (UTLA) union and the Los Angeles Unified School District (LAUSD) resulted in failure. Both the union and the school district—which is the second largest in the country—said they wanted smaller class sizes, bigger teacher salaries, increased school funding and more counselors and nurses in the roughly 1,000 schools that are in the district. Despite the teachers on strike, classes continued at all schools. 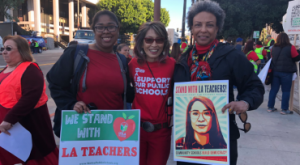 LAUSD hired about 400 substitute teachers and reassigned more than 2,000 administrators to help educate the 600,000 students. Many students, however, did not show up during the first two days of the strike. Only about one-third of the usual number of students who regularly attend the schools actually showed up on the first day of the strike—Monday, January 14. Because the state of California funds schools based on attendance, the district took a massive financial hit on day one. According to Superintendent Austin Beutner, a former investment banker who doesn’t have a background in teaching, “The district on a day like yesterday would lose approximately $25 million in funding.” Of that amount, about 10 million USD made up lost wages of UTLA workers on strike. Lost wages, however, don’t matter to the members of the ULTA union, who are taking personal financial hits. After six days, the UTLA union and LAUSD came to an agreement that satisfied both sides; the teachers now have reduced class sizes. The new deal states that class sizes in grades 4-12 will be reduced by 1 in the 2019-20 school year, 1 in the 2020-21 school year, and 2 in the 2021-22 school year. In addition, classes in grades 3 and lower will be capped at 24 to 27 students. The deal also adds 300 school nurses over the next two years, 77 new counselors over the next three years, and 82 librarians to all secondary schools. The school district also agreed to a combined six percent raise for teachers, including a retroactive three percent raise for the 2017-18 school year and three percent for the current school year. LAUSD said that the investment in nurses, librarians, counselors and class size reduction will cost 175 million USD over the next two school years and 228 million USD in the 2021-22 school year. The money will come from assigned reserves, and a portion will come from an anticipated increase in state revenue, according to LAUSD spokeswoman Barbara Jones.